I have been to a place which is quite different from the usual cafes around. I meet the owner and surprisingly, he is not the eccentric type I am expecting. He, on the contrary, speaks engagingly and loves food. 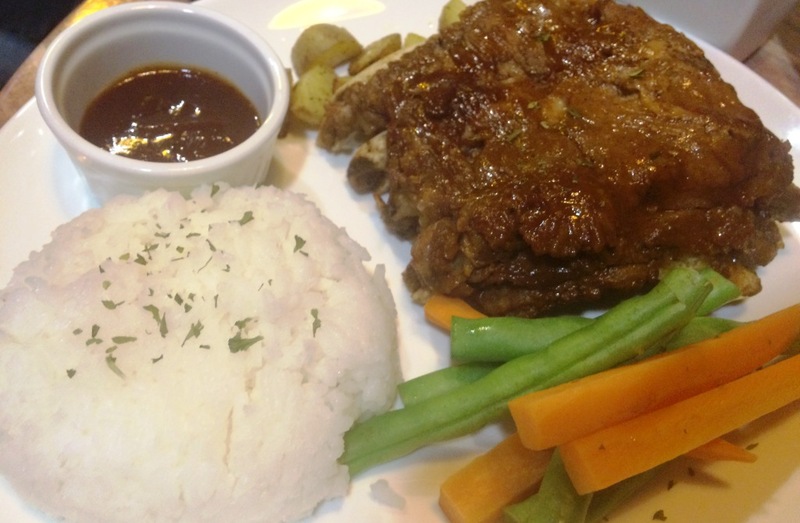 Thus, most of the dishes they serve at Odds Cafe and Nail Spa are exquisitely mouthwatering. 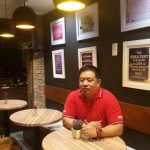 Mr. Art Sebastian, the owner, carefully decided on the menu and tried each of them first before coming up with the final list. Anything just plain satisfactory to his taste was put to waste. That is how hands-on Mr. Art is with his business. And yes, the name of his business is Odds Cafe and Nail Spa. And odd as it may, but they really do have a nail spa upstairs for those who would love to have their nails done while the husband or the kids, perhaps, are busy filling in their stomach. Though it is not always the moms going upstairs for the pampering session as relayed by Mr. Art, a great number of their guests are also barkadas who just want to have fun after a busy day at the office. Of course, a bulk of the customers are families, too, who would love to dine in over some Snakes and Ladders or Scrabble. 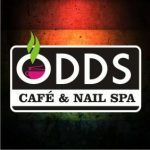 The Odds Cafe and Nail Spa is a first-of-its-kind concept shop that offers food and full-service nail salon in one place. And as a mom, I , too, believe that these two compliment each other and can be served in a single place a the same time. When we had our visit, we saw a customer having her late dinner while the nail technician was busy painting the client’s toes. Together with blogger friend Jing of The Mommy Raketera (in pink alampay). If one finds the place odd because of its food and nail spa concept, others may find the food itself odd. 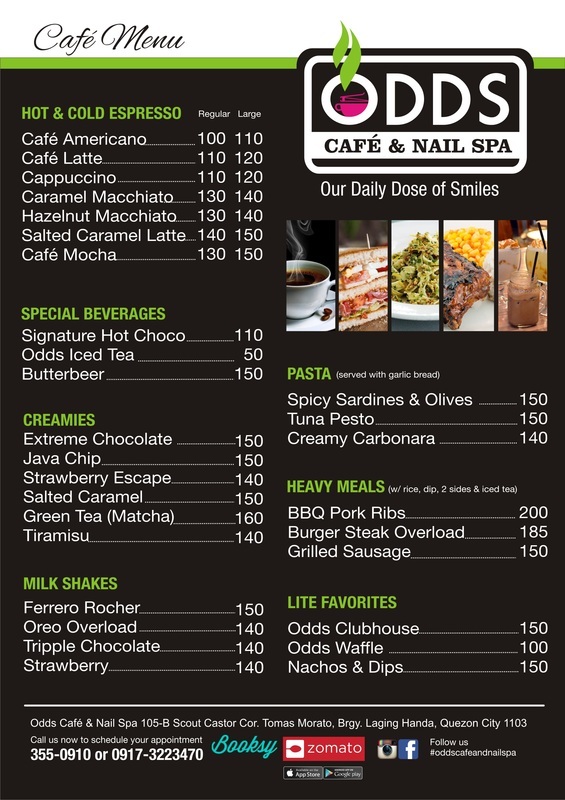 At Odds Cafe and Nail Spa, they offer some of the different-from-what-is -the-usual-meal choices. 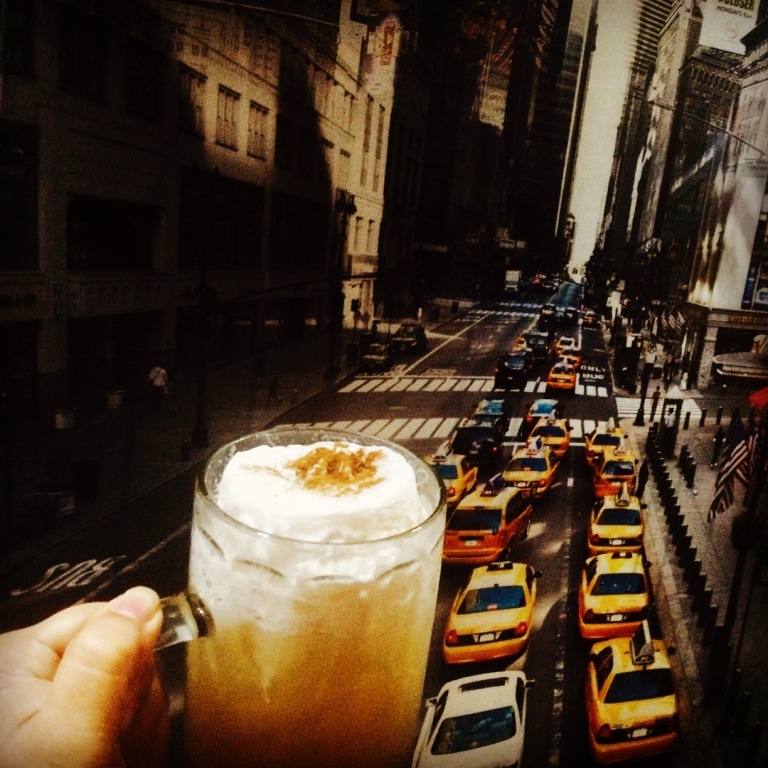 They have Harry Potter’s Butter Beer and their’s is not too sweet. It is served in a really big mug, perhaps, suitable for Hagrid’s size. Another favorite is their salted caramel creamies. It is so heavenly delicious and of considerable size. One could have it while having her nails and I doubt if she could still finish it. It is that big! Their salted caramel latte (either cold or hot) is just as superb. I order for Spicy Sardines and Olives and I like the way it is served. Its spiciness is not the gasping-for-breath type nor feeling-as-if-your-taste-buds-were-on-fire. One could still surely handle the hotness of the sauce as the olive oil balances the taste. However, I would want my pasta to be firm to the bite and not swimming from too much olive oil. 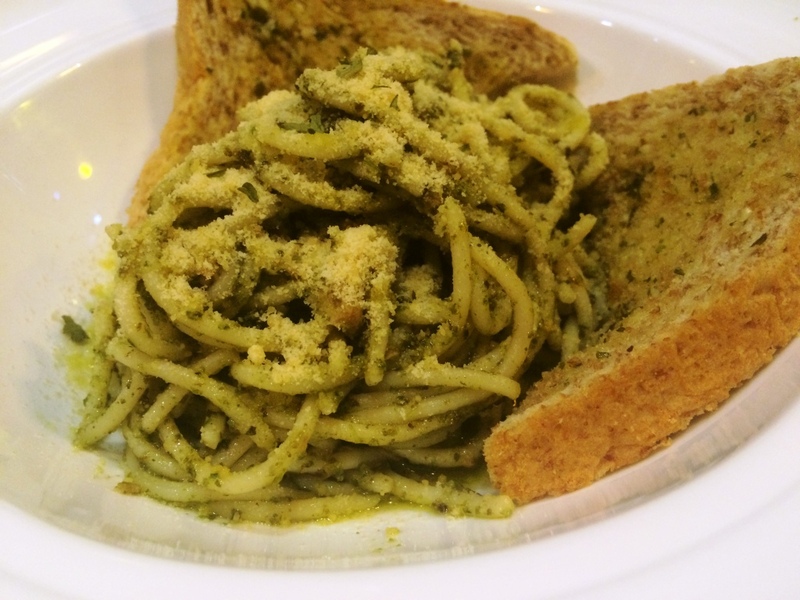 Their Tuna Pesto is not al dente as well. I would like to assume that the cook is just too sleepy he must have forgotten his pasta. After all, it is already eight in the evening. 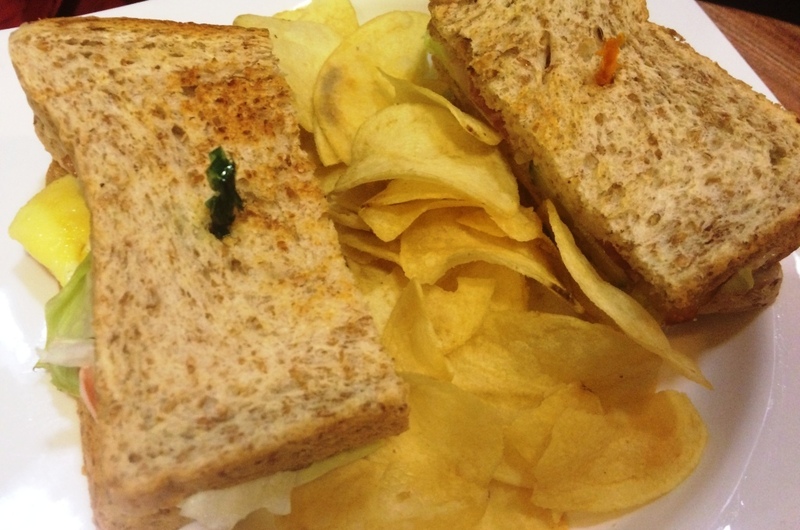 A friend asks for Odds Clubhouse with chips. I like the chips. It is not too salty. The clubhouse, too, is filling as it is heavily stuffed with sliced cooked poultry, lettuce, tomato, and mayonnaise. But what we all like best about Odds Cafe and Nail Spa is their BBQ Pork Ribs. It comes with a special sauce but even without the sauce, the pork ribs is just luscious and finger-licking and lip-smacking. That is how heavenly it is. 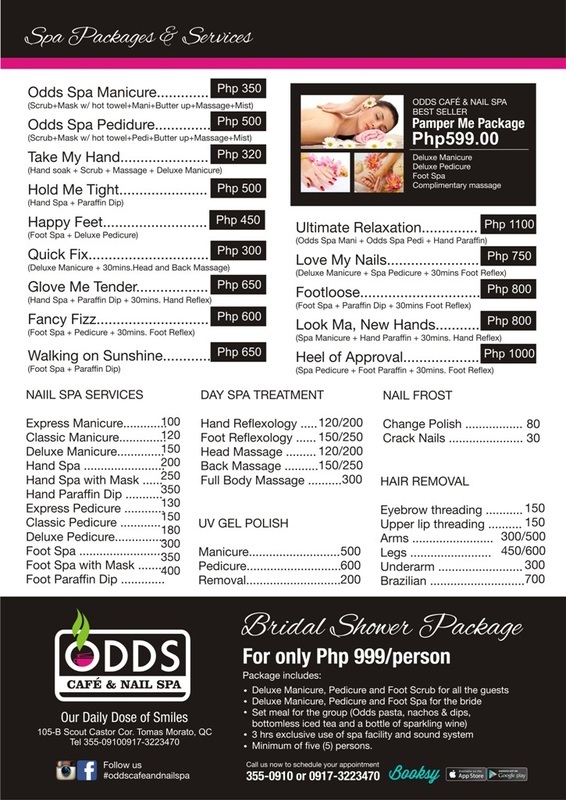 Odds Cafe and Nail Spa is open daily from 12nn to 12 midnight. And for all Saturdays of August, they have their Rhythm & Brews as a special anniversary month-long treat to all customers. Try Odds Cafe and Nail Spa. I am one busy mom and I must say it is worth the visit. You could have your nails done while your family is downstairs having lunch or dinner. The husband could even have some massage treatment. And as for Mr. Art, clearly, the odds are ever in his favor. As I expected, food is cheaper than getting nails done. LOL! Uso na ngayon ang ganyan, dual service establishments and it makes sense, kasi para magkasama ang mag-asawa/kids. Otherwise, kung nail spa lang, sino ba namang husband or BF ang sasama? Saan sila tatambay kung magkasama? Haven’t really thought of this kind of concept! Infusing coffee with nail spa is new to me. But then those two are the ways people pamper themselves during the weekend. So why not? Great recommendation. Yes, the owner must have really been proud of this concept. The owner must have been so proud of this concept. And good decision indeed. That place looks so great. Nail spa and coffee, it is just perfect. Seems like a perfect place to relax after a busy week!! Gusto ko yung couple package on Sunday! Sana matry namin pag uwi ni Dane, bet ko rin ung wax day! haha. Mejo malapit lang to sa’min kaya sana makapunta naman ako dito. Mukhang masarap din food! Thank you as well for dropping by. Gotta try this someday. Thanks. Yes, it is worth the try. Oh, I want a relaxing day at the nail spa! I wish we can have a service like that. Yes, sometimes too i wish to have that kind of place near ours so i need not drive or ask someone to drive for me. What a great combination of a nail spa and cafe. The food looks amazing! Amazing indeed and they all tasted so good. Wow, what a nice way to spend time in a nail spa. I want to try this. Try it and surely you would feel pampered. That’s definitely an interesting combination. Who would have thunk it? It looks like a visit is in order. It is indeed a nice and excellent concept. Really interesting. we need to have more of such 2 in 1 places, even for facials and stuff as sometimes I just want to get some pampering but the husband aka the driver has no place to go! Bribing him with food and coffee and a book or mag would be great. Exactly. Surely the husband would even ask you to have your nails done so that he could have that favorite meal. Hey it’s super near my house! Might just have to try it one of these days 🙂 I admit I find the concept a bit weird, heehee. But as long as the dining area and the spa area are distinct, then it should be ok! Try it. So lucky of you to be within the area. Not because of the diner and spa but i find the Timog area too cool a place (opportunities wise). Haha, i would also prefer food than nails. Hahah. Well that is a way to get pampered all around. And lol at the Hagrid comment. Agreed, that’s a big mug. Big indeed, suits Hagrid’s hands. I would never connect caffe and nail spa, but it’s definitely an interesting combo. And it makes sense when you think about it. Food looks really tasty, specially the salted caramel desserts 🙂 Looks like a place you shouldn’t miss! It is a unique concept and it is being loved and appreciated by customers. Wow, a spa and cafe! Interesting concept! That cold latte looks delicious though! Indeed delicious and the concept is really interesting. Hope that there be of the same concept in other parts of the metro as well. This is the first time I’ve heard of a nail spa and a cafe in one. What more can you need when you’re pampering yourself, right? The food looks great, sorry about the pasta being overcooked though. Yes, i hope the chef was too sleepy that time thus overcooked the pasta. Looking forward to try it again and hope the pasta would be al dente. 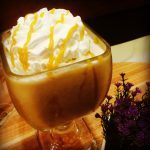 The salted caramel sounds amazing! This looks like such a fun place for mails and food! Haha. Others may find it crazy but the concept is just amazing. And yes, the salted caramel is a best seller. Cafe and nail spa in one? I need this! Looks like you enjoyed your pampering time. Indeed enjoyed our stay. The concept is really cool. what a neat idea! You get pampering and a cafe too! Yes, too cool a concept. Oooo now this sounds like one place I would love to chill. I will have to Check it out! Yup, truly a nice place to relax over good music, food and spa treatment. What a cool concept! 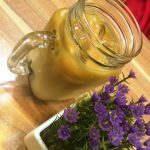 I’d love if they had a place like this by me – food and pampering! Got it right- food and pampering in one place. So convenient! Food and getting nails done? What could be better than that! Sign me up. Haha. So convenient for moms and any ladies, right? This sounds fun and convenient. I wish there was something similar where I live. I would definitely go! Really convenient and yes, you’re right with the fun part, too. I actually think this is a really good idea! What’s better than pampering yourself with a mani/pedi and a good meal?! I couldn’t agree more. Genius idea indeed. That’s a great concept, a place where you can both eat and can get your nails done. Two birds in one shot. I also find the concept interesting and yes, nice.